On December 15, more than 240 U.S. and international labor, environmental, and civil society organizations called on World Bank officials to dismiss a $77 million lawsuit brought by the Pacific Rim Mining Corporation against the government of El Salvador. According to Pacific Rim, the Salvadoran government’s failure to grant a permit for the company’s proposed cyanide-leach gold mining operation violates investors’ rights under the 2005 Dominican Republic-Central American Free Trade Agreement (DR-CAFTA)—even though the mine could poison a river providing water to more than half the country’s population. 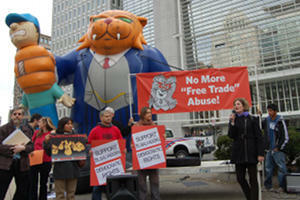 Rally against Pacific Rim at World Bank HQ. Credit: Ron Carver. The suit was brought under the “investor-state” provisions of DR-CAFTA, which allow corporations to sue sovereign governments over actions that allegedly reduce the value of their investments. Pacific Rim, a Canada-based transnational, established a subsidiary in Nevada to file the case (since Canada is not a party to DR-CAFTA). The World Bank’s International Center for Settlement of Investment Disputes (ICSID) is expected to render a decision later this month. In their Open Letter to the World Bank, labor and environmental groups—including the AFL-CIO and 14 U.S. labor unions—charge that Pacific Rim’s action seeks to undermine fundamental principles of national sovereignty and democracy. “Pacific Rim is using ICSID and the investor-state rules of a free trade agreement to subvert a democratic nationwide debate over mining and sustainability in El Salvador,” they state. Tim Beaty from the Teamsters’ Union also spoke at the rally about his union’s history of support for El Salvador labor organizing. Gilberto Soto, a U.S. teamster organizer, was assassinated in El Salvador during a 2004 campaign to promote solidarity between U.S. and Salvadoran dock workers. Four Salvadoran anti-mining activists have been murdered since 2009, and dozens more, including environmental leaders, priests, and community radio journalists, have received death threats. Credit: National Roundtable Against Mining.Meanwhile, anti-mining resistance in El Salvador continues. The National Roundtable Against Mining (known as the Mesa) is seeking to bring a proposed law banning metals mining to a vote before the March congressional and municipal elections. They have allied with other grassroots groups working for passage of laws to promote food sovereignty, water rights, environmental protection, and sustainable development, and are educating voters to support only those political candidates who endorse a progressive agenda. A Central American transnational youth group has organized a campaign called “Not One More Mine” (“Ni1Mina+”), emphasizing the need for solidarity among Honduran, Guatemalan, and Salvadoran anti-mining activists. This is critical for El Salvador, since most of its rivers are already contaminated by Honduran and Guatemalan mining activities (which are not restricted), before they reach El Salvador’s borders. 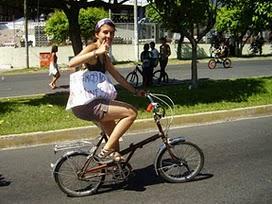 Anti-mining bicycle ride, San Salvador. Credit: Ni1Mina+. According to a new report by the Institute for Policy Studies, the strategy of using free trade provisions to override decisions made by democratically-elected sovereign governments is rapidly gaining traction with transnational companies, especially where conflicts over natural resource exploitation are involved. Forty-three of 137 cases pending before ICSID involve mining or hydrocarbons extraction, up from 32 a year ago (and only three 10 years ago). A new video produced by the Democracy Center (see below) tells the story of three ICSID disputes in Latin America: Pacific Rim in El Salvador (gold mining); Bechtel in Bolivia (water privatization); and Philip Morris in Uruguay (anti-smoking regulations). In the case of Bolivia, a strong international solidarity campaign forced Bechtel to withdraw its claim for $25 million in compensation from the Bolivian government, for a negligible sum. Signers of the Open Letter hope to replicate this outcome in El Salvador. Beyond that goal lies the larger political challenge of modifying DR-CAFTA and other U.S. trade treaties to prevent companies like Pacific Rim from launching such anti-democratic attacks on national sovereignty in the first place. Read more from Emily Achtenberg's blog, Rebel Currents. See also her article "A Mining Ban in El Salvador," from the September/October 2011 NACLA Report, "The Politics of Human Rights," or the September/October 2009 NACLA Report, "Political Environments: Development, Dissent, and the New Extraction." Or subscribe to NACLA.